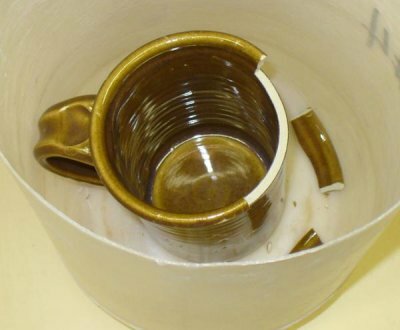 A defect in glazed ware where the glaze is compressed too much by the body, the glaze actually peels off the ware on edges to relieve the stress. Shivering is thus the opposite of crazing and is also less common. 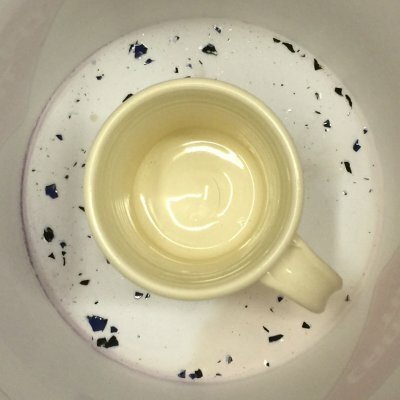 This problem is potentially dangerous, since the tiny flakes of glaze having razor-sharp edges could be ingested (if they occur on functional ware). The solution is a glaze of higher thermal expansion or a body of lower expansion. Other solutions are sometimes recommended (like firing slower), but they do not fix this underlying problem. 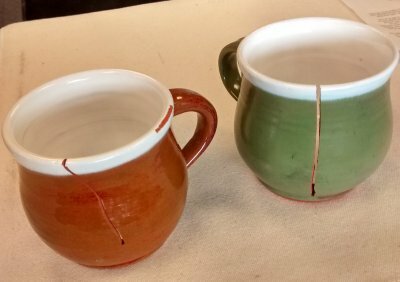 This problem is more likely to occur when the clay-glaze interface is not as well developed, such as with earthenware. 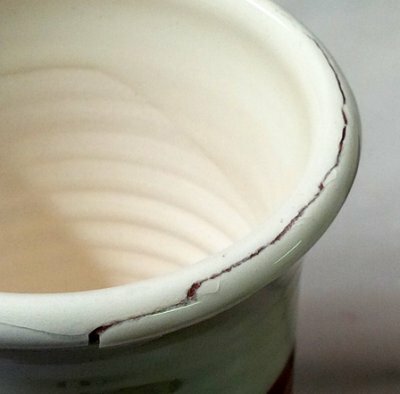 At low temperatures one must play more of a balancing act, since the glaze cannot be under as much compression before this issue (or the opposite one of crazing) occurs. 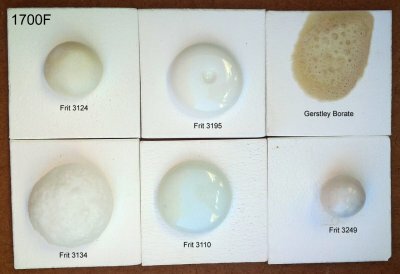 Many low temperature clay bodies (white and red) have talc added to increase their thermal expansion, this is done to reduce the likelihood of crazing with popular commercial glazes. But this also increases the chance of shivering, especially for people who mix their own glazes. It is important to have an adjustment in your base glazes to tune the fit, for example, a higher and lower expansion frit in the recipe. If shivering is observed, the proportion of higher expansion frit can be increased. Clay body manufacturers must pay special attention when they need to change talc suppliers, adjusting the body recipe to compensate for any differences in the expansion the new talc imparts (for example substituting a little of the talc for pyrophyllite to lower the overall expansion). 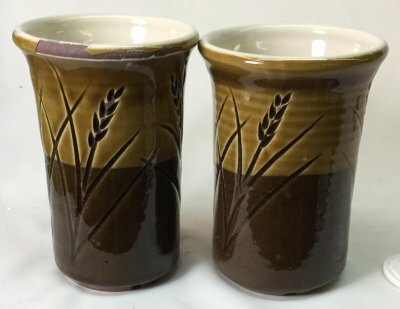 High temperature reduction fired brown burning stonewares can be an issue. The warm variegated colors of these bodies depend on their not being vitrified. This less developed surface does not develop as good of an interface with the glaze as buff stonewares or porcelains. This means that glazes under excessive compression will shiver off more readily. One needs to have realistic expectations about the thermal expansion resistance of these bodies. Shivering also occurs in stoneware bodies that have high quartz content, such of those made with high percentages of fireclay and ball clay (and even silica additions on top of that). Increasing the KNaO content of the glaze will fix the problem (feldspar is the major contributor). By the same token, high feldspar glazes are the most likely to work. 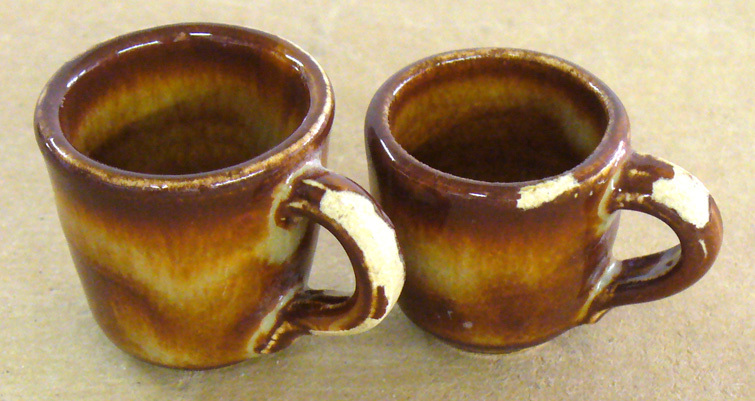 Normally clay bodies should have a higher thermal expansion (and thus higher thermal contraction) than the glaze. 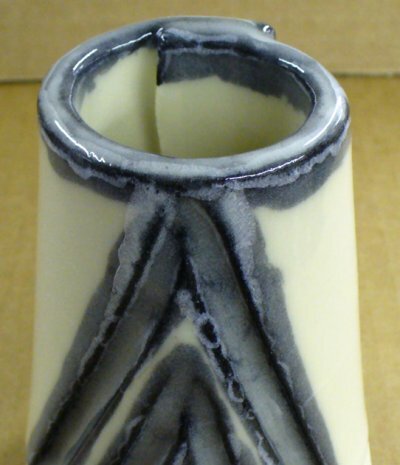 When this is so the glaze is put under compression as the piece cools in the kiln. This situation not only strengthens the ware but prevents the glaze from crazing when the surface is cooled suddenly (and contracts). The higher the temperature and the better the body-glaze interface, the greater the compression that can be tolerated and the greater the potential is to increase strength and resist future crazing. Of course the question is, how much higher should the body expansion be? 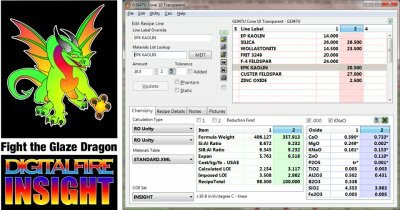 It is generally best to do the testing for this rather then rely on calculated numbers. Make ware and subject it to the sudden heating of ice-water to boiling water. If crazing or shivering occurs, do the calculations to move the glaze expansion in the right direction and retest. This mug is in the bottom of a plastic bucket. It has been pinging every few minutes. For days. Razor-sharp chips of the dark blue glaze on the outside are popping off. This is happening because its thermal expansion is too low compared to this low fire talc body. It needs a frit having a higher co-efficient of thermal expansion (typically having more K2O and Na2O). This flake shivered off the rim of a low fire terra cotta mug. It is Fishsauce slip. It is about 2 inches long and has razor sharp edges. This is not the sort of thing you would want to be falling into your coffee or food and then eating! This flake did give evidence that it was loosening so there was little danger of me consuming it, but smaller flakes can go unnoticed. Slips (or engobes) must be drying compatible, have the same firing shrinkage, the same thermal expansion and be quartz inversion compatible with the body. It is easy to ignore all that and pretend that it works, but the bond between engobe and body is fragile at low fire and easily compromised by the above incompatibilities. Slips must be fitted to the specific body, glaze and temperature; that involves a testing program and often a little chemistry. I have documented online how to I adapted this slip to Plainsman Terrastone 2 using my account at insight-live.com. Talc is employed in low fire bodies to raise their thermal expansion (to put the squeeze on glazes to prevent crazing). These dilatometer curves make it very clear just how effective that strategy is! The talc body was fired at cone 04, the stoneware at cone 6. The former is porous and completely non-vitreous, the latter is semi vitreous. 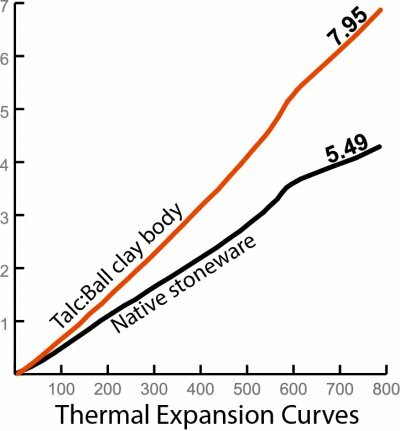 This demonstrates something else interesting: The impracticality of calculating the thermal expansion of clay bodies based on their oxide chemistry. Talc sources MgO and low fire bodies containing it would calculate to a low thermal expansion. But the opposite happens. Why? Because these bodies are composed of mineral particles loosely sintered together. A few melt somewhat, some change their mineral form, most remain unchanged. The body's COE is the additive sum of the proportionate populations of all the particles. Good luck calculating that! Classic terra cotta bodies are not vitreous, so engobes used on them need to have similar low fired shrinkage. But when terra cottas are fired above cone 04 they start to mature and fired shrinkage increases quickly, flaking off engobes that do not have sufficient added frit (to increase their shrinkage). Even if an under-compression engobe can hang on, the extra stresses of an overglaze of lower thermal expansion can compromise the engobe:body bond. 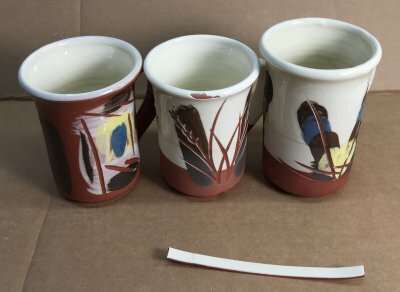 That has happened on the center mug. That engobe has less frit (10% vs. 15% for the others). The clear glaze on the left has high thermal expansion and is crazing, while the engobe:body bond can tolerate that it, is obviously not desirable.